Once again, I feel like I am doing everything last minute! Oh no! What are we having? Is there a plan? Ahhhh! Last night I was reading blogs in and coincidentally a recipe for New York Deli Rye Bread popped up on Smitten Kitchen (speaking of recipes on Smitten Kitchen, I still need to make the Homemade Oreos -- minus the filling -- for N). The rye bread recipe looks promising! At least eight hours to make it? A sponge? Yes, sounds like the right type of bread recipe for us. G's solution: use less (or more) to achieve desired results. Last week, I reminded G to make less spicy wings, for the less-spice-liking folks on Saturday. He acknowledged and confirmed. When we were packing up to go, I noticed he pulled out his [spicy] spice rub. me: "I thought you were going to make less spicy wingz?" G: "Yes. I will just sprinkle less rub." Exhibit #2 - Just extend grilling time if the grill is not hot enough. Some time ago, he was grilling [insert meat]. And I thought it was taking longer than usual. Finally he put meats on the plate. And I thought, huh, this is terrible. G: "The grill was too low. I thought I had enough charcoal. I just cooked it longer." me: "Oh, why didn't you say something? We could have finished in the oven." My solution: Just caramelize it. It will taste better. Exhibit #1, 2, 3, 4, 5 ... As I look through my food pictures, everything looks like a dark shade of caramel. Whoops. Exhibit #1 - Pears and onion pizza is missing bacon. N was raving about the pears & onions pizza Sh put together. The pizza tasted better than he thought, but felt it was missing something. He thought about it for a few. N: "I know! It needs bacon. Sweet, salty, savory." Exhibit #2 - Bacon explosion. N made bacon explosion, twice. J's Solution: Missing something? Add citrus or vinegar. Exhibit #1, #2, #3 - Every time J thinks something is missing, she opts to add some (more) lemon juice, lime juice, or vinegar. J, "It will make it taste more fresh and punchy!" See asparagus with capers, lemony potato salad, pelmeni broth. J, "Hm, not everyone likes their food quite as tart as I do." I trust you are having a good start to the week! I sure seem to need a lot more coffee on Monday and Tuesday than Wednesday through Sunday. Maybe I'm not the only one? I have received word that N has prepared corned beef and pastrami for their boiling and smoking on Saturday morning. We will be having a trial run of rye bread today or tomorrow (then it will become rye croutons!). I have been racking my brain trying to figure out what sort of green stuff goes with corned beef and pastrami on rye. I am starting to think that the boys intentionally select meat products that do not "go" with the green stuff! I'm browsing Mark Bittman's 101 Simple Salads for the Season (NYT link) for ideas even though it's summer-season-based. A couple of simple, vegetable-heavy salads could be the antidote to mass quantities of meat and carbohydrate. I was also eyeing this Gourmet recipe for a Lemon Curd Tart with olive oil... maybe in a few weeks. It was fun to move the partay to Chez Davis's - all the fun, none of the clean up! Oh, and many bottles of wine. There was a moment, after I pat out the four little dough, that I thought we do not have enough food. Seriously. The two pounds of mozzarella cheese, red and bbq sauce, two kinds of pepperoni, fresh basil, fresh mozzarella, roasted chicken, red onions, white onions, cilantro, mushroom, and Bosc pears made some tasty combination of pizzas. Do you think we are not so good as estimate? The salad was a hit and definitely should be repeated, often. Do you like the mix of arugula and herb mix? N declared this salad as his favorite. The pears were a bit under grilled. But I couldn't really tell in the dark outside. I wasn't too sure about the new wingz sauce, but today the leftover tasted 'better'. I think all leftover taste 'better' by themselves, when we are less full the next day. By the time dinner was ready, I think we had consumed three bottles of wine? G was making fun of me that I interrupted and zinged my comment into the heated religion + politics discussion, then ran off to make dessert. You brought two awesome lemons and saved the raspberry pufftarts. I can't believe I brought cranberry sauce instead of raspberry puree. I really should label my freezer bags. The raspberry jam was a good stand in, phew. By the time we brought the pufftarts to the tables, I believe the men had consumed three additional bottle of wine? Oh what fun! All in all, a very fun seven bottle of wine evening. Thanks CD for hosting us and letting us use all the plates and pans and make a mess in your kitchen! I gather from N's comments that he has already started next week's menu? on low heat, saute onion until soft. add ginger and garlic, saute for another minute. pour in tomato sauce, add chipotle pepper, stir in 4 TBS of dulce de leche. simmer. blend to combine. I have been thinking about vegetable sides for this weekend. I only have a few things leftover from last week's farm share -- a bunch of celery, some braising greens, apples and pears -- not enough to plan from. While winter up here in the Pacific Northwet is a whole lot milder than I am used to, I still find myself craving heavy, calorie-dense "vegetable" dishes -- gratins, thick soups, casseroles. I generally stay away from these sort of dishes because they tend to be less vegetable and more cream, more cheese, more topping. I want more vegetable, not less vegetable! I did find these interesting recipes that are... more cream and carb and less vegetable. Winter is hard. There's always my staple roasted root vegetable "recipe," too. I've also taken the roasted vegetables and tossed them on top of a goat cheese filled tart -- but that takes us back to more cheese, more carb, less vegetable. Dammit! Hyper vs sluggish. Sluggish wins. How are you on this fine morning? I have a hangover from the 1/3lb burger from Saturday. Or maybe the sluggishness is from the large quantity of guacamole I consumed. This second cup of coffee should help. This week's dinner will be chicken wings and raspberry turnovers. (... still need something green and a main dish ...ideas? ) We could have our standard chicken wingz, dry rub, grill, then sauce. Or I was thinking of trying one of these recently collected wings recipe? Oh! look, I still have 29 minutes before I completely fail to start my day. As you know, we are always trying to ensure that our meals have the appropriate amount of "green stuff" along with the requisite meat and starch the boys require. I provided green leaf lettuce for our burgers on Saturday. I like green leaf because it is crunchy and tastes like something other than water in leaf format. N complained that he only likes iceberg on his burgers (please note that N likes other types of leafy greens at other times, just not on his burgers). I know G prefers romaine in all cases (but he is too polite to say anything). Is it overkill to provide three types of lettuce for burgers for four people? On Saturday, we had a simple dinner for once. hamburgers cooked by N on the big green egg -- he will tell you he still hasn't perfected burgers on the egg yet, but soon -- with "build your own" toppings: sauteed onions, mushrooms, lettuce, blue cheese, swiss cheese, cheddar cheese, plastic cheese. We eventually dragged the boys away from the tv and played two games. Saboteur -- we are slowly coming up with our own modifications for the game. I had 8oz of cream cheese in the fridge that has been crying out (leftover from the eggnog cheesecakes from Christmas). I needed to use them. So I found Chocolate Cream Cheese Cupcake recipe at epicurious. How prefect. I added orange zest and a little juice to the cream cheese mixture. They overflowed like mad. Whoops. 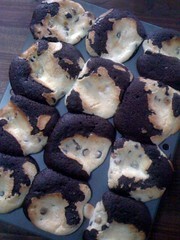 Should have grabbed the other muffing pan. Too lazy. Who makes the coffee around here? I find it very tricky to make just the right amount of coffee. The end.